Researchers from the University of Dundee have defined the structure of a recently discovered enzyme, raising the possibility of learning more about the evolution of organisms over billions of years. Using X-ray crystallography, Professor David Lilley and a team from the Cancer Research UK Nucleic Acid Structure Research Group at Dundee’s College of Life Sciences were able to determine the three-dimensional structure and mechanism of action of the ‘twister’ ribozyme, discovered by scientists at the University of Yale earlier this year. 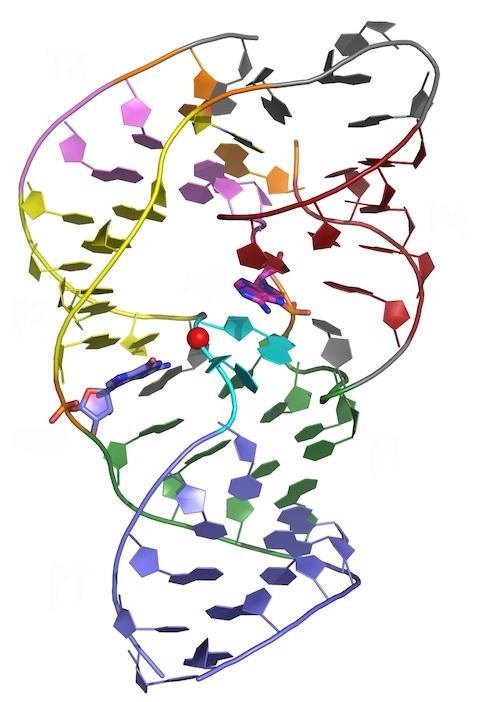 While most enzymes are made up of protein, ribozymes are enzymes that are made of RNA. They speed up some of the most important chemical reactions in the cell, and are thought to have played a key role in the origin of life on the planet. The Yale team named their new ribozyme twister because it resembles the Egyptian hieroglyph "twisted flax". This species accelerates the cleavage of a specific location in RNA by about a million-fold. This has been found to be very widespread, occurring in bacteria, animals and plants, although the precise role played by twister in the control of gene expression and other processes remains unclear. Professor Lilley and his colleagues determined a high-resolution structure of the new ribozyme, which, taken together with chemical studies, goes a long way to understanding the nuts and bolts of how the ribozyme works at a molecular level. They showed that the RNA folds up in three dimensions to form a unique and beautiful shape termed a “reversed double-pseudoknot”. This then brings key parts of the structure together so that they can carry out the required chemical reaction. “Most molecular changes are governed by proteins, but we know that two of the most important of these inside living cells are actually catalysed by ribozymes,” said Professor Lilley. “The discovery of this new RNA by the Yale team raised the obvious question – what does it do? “This particular molecule is found in bacteria, plants, and animals and fish and is so widespread that it must play an important role, and determining the structure and action will help to unravel the mystery. The Dundee work also represents something of a speed record in molecular structure determination. The original paper from the Yale group presenting the first identification of the twister ribozyme was only published in February of this year, and the three-dimensional structure has been determined just five months later. The research is published today in the Nature Chemical Biology journal.